In LOST CHILD? filmmaker Gregory Ruzzin invites you along on a lighthearted journey as he uses his camera to bridge an ever-widening gap between himself and his sister Alyssa. What begins as Ruzzin’s attempt to salvage his withering relationship with his younger sister evolves into a journey of discovery, ultimately resulting in a vibrant and moving portrait of Alyssa Ruzzin, who struggles with epilepsy and a developmental disability as she makes a life for herself in Evanston, Illinois. Often humorous and always inspiring, Alyssa is open, honest, and painfully articulate. She tells it like it is, without pretense or agenda, and along the way she wins your heart…and her brother’s too. 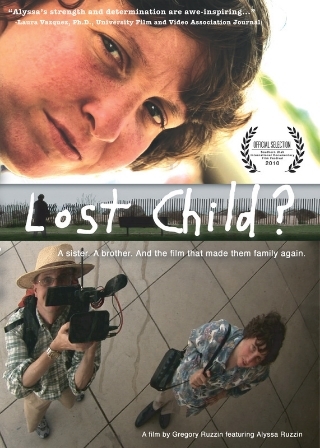 Lost Child was my first documentary film. Scoring it was a challenge, because the music played a different role than in traditional dramatic narrative films. Ultimately Greg (director) and I settled on the idea that the music should represent Alyssa's inner life - not how the world sees her, but how she sees and successfully deals with the world despite her epilepsy and a developmentally disability. Each day, Alyssa gets through the day by adhering to a strict regiment. Even though every day is different, the regiment remains very similar. My idea was that the score would reflect this by using short motifs that repeat themselves over and over, but move in and out of phase with each other to create constantly evolving pieces. Ultimately this idea created a beautiful, minimalist score that perfectly fit the film. The complete score is available for purchase on iTunes and on Amazon. After decades apart, filmmaker Gregory Ruzzin and his younger sister Alyssa struggle to reconnect as adults. She battles with epilepsy and a developmental disability. Often humorous and always inspiring, LOST CHILD? is a profoundly touching story of love, overwhelming courage, and human dignity. Check out the film's website: www.lostchildmovie.com for updates and to buy the DVD.